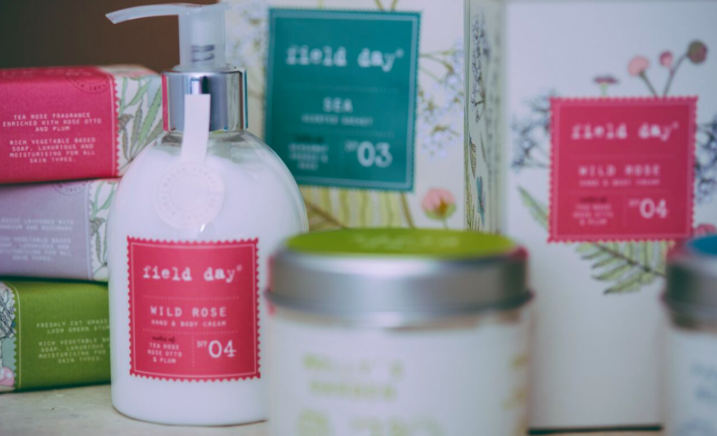 What is your favourite Field Day Fragrance? My favourite fragrance is Wild Rose. Tell us why you love it so much? I've never been a fan of rose scented fragrances until this one. In the past I've found them a bit too heavy or reminiscent of perfume, but Wild Rose is very natural, and just as the name implies, it brings to mind the freshness of wild roses and breezy country air! Which product do you use most in this fragrance? Though I really like the candle and soaps, it's the diffuser I use in several places, including the hallway and bathroom, because you have gorgeous fragrance 24/7. The glass containers are so pretty and I'm also a fan of the label with that deep shade of beautiful rosy coral pink - it's clean, bright and modern. I love that hit of fragrance just as you walk through the door of a room - those small pleasures in life really do make a difference. Who would you recommend this fragrance to? I'd recommend any of the Wild Rose products as a treat for yourself or as a beautiful gift for friends and family of all ages, particularly those partial to a floral fragrance. One of the things I like about the Field Day range is that you can make up a set of matching products, even though just one is a very special gift. But I also love that I can tuck a Wild Rose Freshener into something as simple as a card because it's flat and easy to post. What's the best thing about working at Field Day Ireland? It is hard to narrow it down to one thing. Of course it's a pleasure working with such beautifully scented products - we never get tired of being met with that gorgeous wall of fragrance just as soon as we walk through the door in the morning. But it's also great working alongside such fabulous people - we have a special team working behind the scenes at Field Day with Alix, our very creative, talented, and caring boss at the helm! Each person takes personal pride in getting everything just right. As we carefully label, prepare and pack the products to be sent out for shops and internet orders, we can easily imagine how delighted everyone will be to receive and use them, because we've been there ourselves - and along the way we have some good craic and set the world to rights too! The entire Wild Rose range can be found on this link. Thanks to Bridget for writing this wonderful favourite fragrance blog post for us.